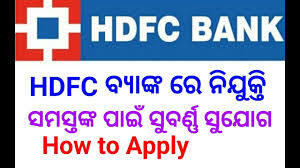 Home / POLITICAL-NEWS / SPORTS / Job in HDFC Bank odisha apply to MBA Students Only. Job in HDFC Bank odisha apply to MBA Students Only. Hdfc Bank Job in Odisha gets a chance to apply now. BANK-Hdfc( payroll). Post-Relationship officer. Qualification- +3 & above. (with sales exp). Salary-13k to 15k. SBI Bank Job in Odisha gets a chance to apply now. SBI Credit card. Post-Team leader.Salary-15k to 17k. Qualification-+3 and above(with exp on sale). Location-Bbsr, Puri.Odisha.